Recently we saw an article from HGTV that discussed flooring trends to try. Well, we’re not going to disagree with HGTV as to what types of flooring they think are best but we can give some additional details about most of the flooring HGTV mentions. First up was bamboo, a great alternative to traditional hardwood flooring. We have discussed bamboo flooring before on FloorTalk.com and we still recommend the Mohawk Hilea Strand Bamboo floor product. Bamboo is a very resilient floor, durable and strong even though it is made from a type of grass from the orient. The Mohawk Hilea Bamboo is one that can be installed on a variety of subfloors with glue, staples, or nailed down. If you choose the Mohawk Hilea Bamboo floor with Uniclic you can actually float the flooring since Uniclic allows fast, easy, installation. The Mohawk bamboo flooring features a width of five inches for planks and comes complete with Crystalshield, an aluminum shield matte finish, and a 25 year residential warranty or 3 year commercial warranty. Large format tile was another hot trend HGTV spotlighted. The Earthwerks Avante line is the go to flooring line for this. The Avante line of luxury vinyl grouted tile is a durable and affordable alternative to natural stone and porcelain tile. Porcelain tile is popular in the 12″x24″ size and Avante has 4 styles available in this size as well as another 12 styles in a 16″x16″ size. The Avante tile flooring has four coordinating grout colors to match its various colors. This product comes with the Infinity Shield for extra protection and a vivid surface texture finish. Avante is great for the home with a lifetime residential warranty. Cork is about comfort in wood flooring. It has also become more durable and the color choices are expanded as well. However, it’s not really meant for below grade where moisture could be an issue and cork should not be in a room with great amounts of direct sunlight either. As a natural product it is susceptible to fading. The cork floors from Qu-cork are our choice offering high quality cork panels that use the UniClic glueless installation system. In luxury vinyl tile and plank there are a number of quality choices from DuraCeramic and DuraPlank to Armstrong’s Alterna and more. Earthwerks has a unique product that we have featured previously on FloorTalk.com, a loose lay vinyl plank and tile with great appeal. As we mentioned in our past review this product has a glueless installation with two options for you. One uses the Rapid Clic system for floating floors and the other uses the Accu Clic. There is a difference in the plank sizes (Rapic Clic is 7″x48″ and Accu Clic is 6″x36″) and the warranties differ but both are available in an array of designer colors and styles. We felt that the HGTV article lacked a good explanation of what they termed as “cut and loop” carpet. What we think they meant to describe is actually called level cut loop or LCL carpet. 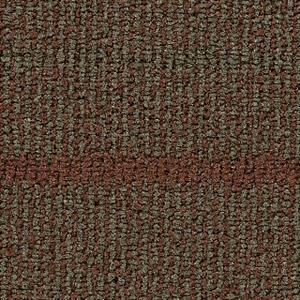 This carpet is a great choice for high traffic areas and is normally a nylon fiber construction made up of a combination of twist or plush fiber and loop fibers. These LCL carpets are normally found in a 12 foot width and the only shortcoming found in this carpet type is that they sometimes don’t seam up as neatly as other types of carpet. Due to its flatter and tight construction the seams tend to show a little more. Still these are a great choice for residences and can be found in patterns from very elaborate to simple to match all tastes and decors. 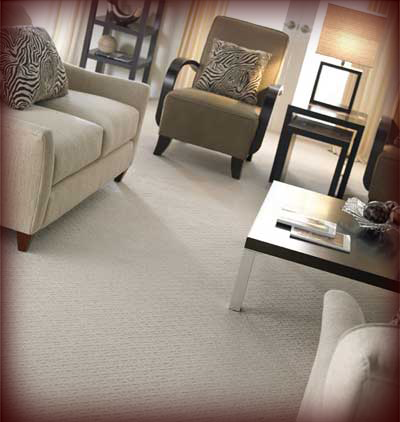 The Bliss line of carpet from Beaulieu is a great choice for this type of floor covering. Who could ever dispute that Hardwood Floors are a great choice for any home? I don’t know if I would even consider these a trend, more like a classic flooring choice. The big trend is actually in where the hardwood is being supplied from. Instead of using woods from Europe or Asia we are finding a great selection of North American Hardwood varieties making their way to the market. 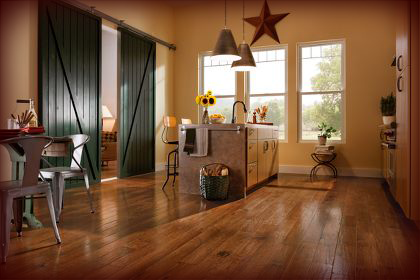 Armstong Hardwood Flooring is one of America’s most trusted hardwood brands and maker of Armstrong American Scrape. This collection of textured hardwood floors is inspired by the breathtaking diversity of the American landscape and is made in the USA. These wide planks in random lengths create a custom look without the custom price. Concrete floors are nothing new, but concrete floors you would want in your home as part of your decor are. 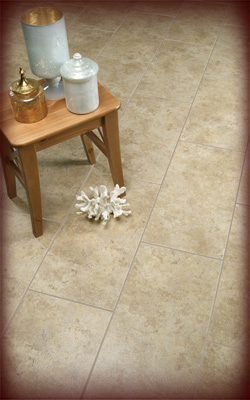 We don’t review concrete but Karndean has a new line of luxury vinyl flooring that has the look and finish of concrete. However, since it is vinyl it will have much more warmth underfoot and be much more forgiving to dropped items while still being quite durable as well as being a loose lay product. No clicking, no gluing, and no locking just lay it straight and go. 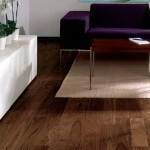 The only trend we can’t offer any suggestions or additional information on is the category of reclaimed wood flooring. However, with the varieties and availability of Armstrong American Scrape and other hardwoods you will likely find a new hardwood floor with a great warranty and discounted pricing to fit your wood flooring needs. If you have any additional questions about our review of the 8 top flooring trends according to HGTV please let us know, we would love to discuss some flooring with you! Congoleum DuraCeramic Reviewed and Tested By Consumer Reports.